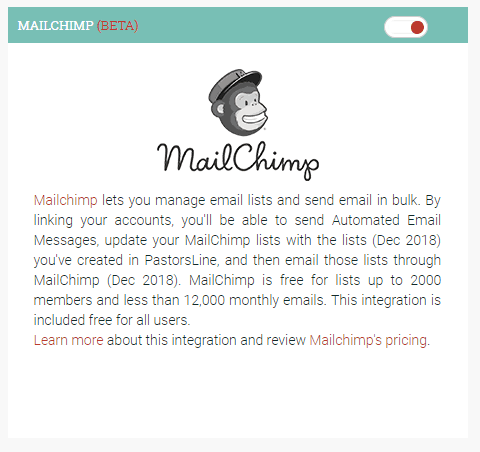 Improve your church communications (and reduce your workload) by integrating your MailChimp and PastorsLine accounts. Integrating PastorsLine and MailChimp gives your church improved communication and better relationships with your church members and first-time guests. Integration also reduces your workload. MailChimp. You have already captured important data. and enjoy the fruits of your previous labors. The MailChimp Integration with our system is now in public beta. Imagine adding an email integration which can help improve your guest follow-up process, member assimilation, and/or just automating the sending of longer content via email. What we didn't want to do is reinvent the wheel and try to create what other companies have mastered—not only the design options but also the understanding of email compliance and deliverability. We believe if you have not already automated your email delivery through the integrations we currently support (CCB & PCP), the next best option is to integrate with MailChimp. MailChimp offers 12000 free emails per month for up to 2k subscribers. They have great email templates, a great reputation, and comply with best practices to ensure your email can be delivered. Here's what we offer now! Ability to import your MC lists or groups into PastorsLine and send out texts. Ability to automate an email to go out by choosing one of your saved templates in MC. Here's what we plan to work on soon. Ability to write the body of an email and send using an MC template. Ability to add someone from PL (keyword or manually) and move them over to a list or group within MC. This is how you can automate follow-up emails. What do you need for the integration? In MC, data is captured via a form. On PastorsLine, it is captured via text message—easier for you and your subscribers. So, capture the data on PastorsLine, and send it back to MC. that info into a MC group immediately. E.g. As your church grows with PastorsLine, you will most likely be adding new subscribers and new groups. All this can be synced back to MC, keeping both apps up-to-date. 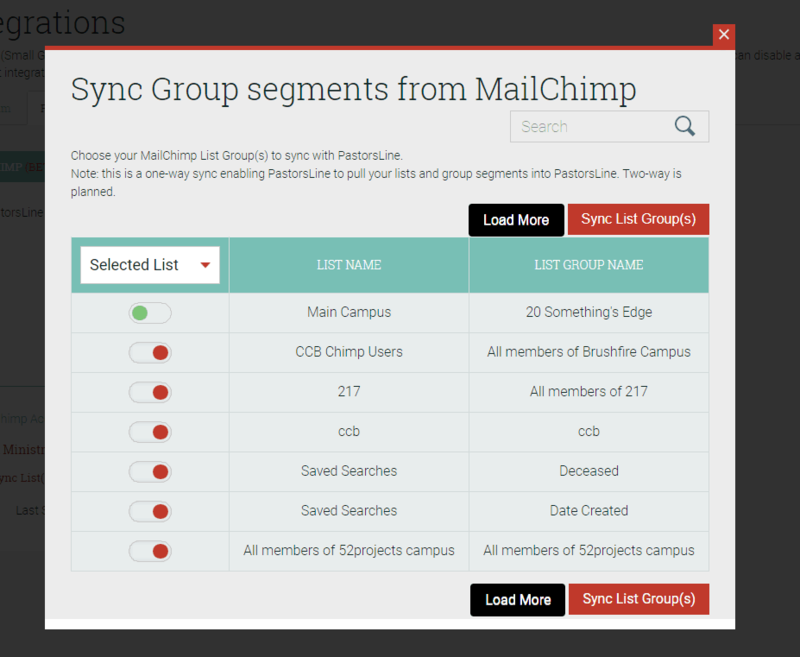 You will be able to sync some or all of your MailChimp groups to PastorsLine. You can create a new MailChimp group or sync to existing groups from within the PastorsLine interface. Why are you using MailChimp to send automated emails? MailChimp has an excellent free tier that anyone can use. This free tier covers 12000 emails per month. MailChimp is also great at what they do—templates, analytics, sending mass emails, etc. Instead of reinventing the wheel, we have decided to allow you to use the #1 email newsletter for churches and non-profits. Does it cost us additional credits to send emails through MailChimp via PastorsLine? Absolutely not—another thumbs up for using MailChimp. Since we are sending messages from our system through MailChimp and they offer a generous free option, we wouldn't need to charge you for usage. Additionally, since our business logic is built on using MailChimp to send emails, we are absorbing the costs to develop this integration and process these emails through MailChimp. I don't use MailChimp. How can I send automated emails? That's the beauty of the integration and why the free MailChimp tier is incredible. You would only need to set up a free MailChimp account, enable a MailChimp-PastorsLine integration, and edit your email templates in MC. We will then pull those emails in, and you can send them over and over again, using our automated messages campaign feature. Can I send mass emails from PastorsLine through MailChimp? A lite version of sending a mass email to a group in PL is planned. However, we are not focused on allowing you to send mass emails. If you want to send mass emails on a regular basis, it will be better to do this directly within MC. What we are doing for you is pulling in your lists and groups if you need to send text messages AND we can send automated emails to your guests or members. Integrating is not scary... ...because PastorsLine takes excellent care of your data. PastorsLine processes all data securely using our SSL certificate. We also follow all industry ‘best practices’ standards regarding handling and treating data. PastorsLine never deletes groups or contacts on your church’s MC account. In addition, you can always opt-out. Your church always retains full control of your data. At any time, you can roll back the PastorsLine app in order to easily disable the MC integration. The best news is that as your church grows, PastorsLine and MC can continue to sync your new contacts and groups up to an unlimited number with virtually no restrictions. If you sign up today, we will give you a bonus 500 credits. The invite code is MAILCHIMP. So act now. No CC required. No obligation to purchase. We will NOT automatically bill you if you are using our FREE trial. Try it, risk-free. Get 500 FREE credits now!